I have found a new love! I know it might sound silly but it’s true. It all started with a wedding (doesn’t it always?). My friends got married as few months back and at the same time bought their first house (completed the day they got back from their honeymoon!). Neither of them really had anything to put in the house, it being a first for both of them, so as a wedding present I got them some vouchers to help furnish the house. However being a sewing bee and feeling that this was a little impersonal (ok, that’s just an excuse, I wanted to make them something) I decided to make them some tea towels as well. I chose some egg blue linen and some turquoise linen/cotton mix and made the tea towels (47cm by 64cm including seam allowance). I have to say that I was pleased with how the colours complimented each other however they were still a little bland. So I did what I’ve never really done before and……. (drum roll please)…… decided to embroider a pattern onto each tea towel. Oh I have done embroidery before, on small items, such as my phone case or my changing bag, but it’s always been simple running or back stitch. To be honest I’ve done cross stitch but have either got bored; got lost or wanted to go off on my own rather than following the pattern, so most of my cross stitch endeavours lie half finished at the bottom of my sewing box (terrible I know!). I have always found embroidery daunting. It look beautiful but I was (still am to be honest) doubtful to whether I could pull off the finish. My Great Aunt taught me the basics of sewing (cross stitch mostly) and so I’ve mainly taught myself. Most of my stuff is pretty basic, but I love it. Anyway, getting back to the story: I decided to embroider two different designs onto these tea towels. I made four, so one design on each colour. I had recently found a book called doodle stitching which not only gives you an easy to follow run through of different stitches but also, I feel the writer gets across her passion for stitching, whatever you like – basically stitching your doodles. I had never really though of it before. It inspired me to embroider these tea towels and I have to admit, once I’d finished them, I was hooked! I love it. It is so relaxing. I can’t draw very well. My whole family is amazingly creative (my sisters did fine art and graphics at Uni) but I have never been able to draw. Put something into my hands however and I can make it into something. Embroidery is like that for me. Unfortunately I haven’t a picture of my (now) famous tea towels as the light was too bad to take any good photos. Anyway, It’s probably for the best as they were supposed to be a personal gift. I do however have a picture of the project I did next. 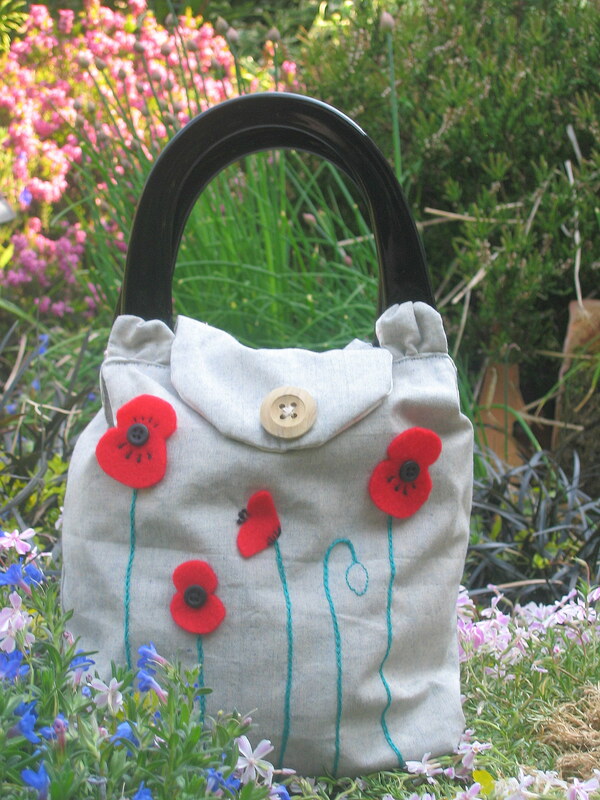 This is my Poppy Bag. I know that there isn’t much embroidery on it however it was designed with the poppies in mind. I got the pattern from my favourite sewing magazine, ‘Sew Hip’. In the magazine they have a lovely sunflower patterned fabric and I loved the idea of the late spring flowers. Ever since visiting Norfolk a few years ago and being amazed by the beauty of the poppy fields there, I have wanted to do something with poppies. I chose Black handles to tie in with the very black centres of the poppies and used a green thread that matched the colour of the stems of our oriental poppies in the garden. I also chose the button (which is just for decoration) as I think it some how adds to the country feel. It isn’t much but it was fun to make and makes me happy every time I go out with it. I have started playing with some scraps of the bag fabric to see the different effects I can get with different stitches. I am completely hooked! If the ‘doodles’ work then I’ll up load some photos.